What Metals Can Be Recycled in Oak Brook? 30 Jul What Metals Can Be Recycled in Oak Brook? Metal recycling carries with it a number of different benefits. These range from the environmental, to the economic, to the social, and beyond. In short, when metal is recycled, we all benefit in some way. Would you like to do your part? Do you have metals that you’re looking to recycle? Wondering what metals can be recycled in Oak Brook in the first place? If so, read on! Do you have any unused iron products laying around the house? Iron can be used in everything from kitchenware, to fences, to work tools, and much, much more. Fortunately, iron can be recycled. Typically, after iron is recycled, its recycled form is not quite the same level of quality as its original form. This, however, does not stop it from serving a bevy of different functions. Another type of metal that can be recycled is stainless steel. In most cases, recycled stainless steel is at about the same quality level as fresh stainless steel. Because of this, it can be recycled repeatedly without losing its performance or functionality. The list of products that are made out of stainless steel is vast. Some of these products include kitchen appliances, pipes, watches, and car components. One of the more commonly recycled metals is aluminum. Because aluminum is used in pop and beer cans, almost everyone on the planet has recycled it at least once. Of course, aluminum is not just used in pop and beer cans. Other aluminum products that can be recycled include aluminum baseball bats, golf clubs, foil, fencing materials, and much, much more. Like aluminum, copper is one of the most commonly recycled metals on the planet. This is because it’s used for just about everything, including electrical wiring, pipes, and other vital construction materials. 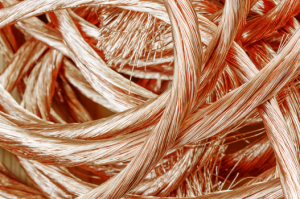 The truth of the matter is that almost every home in the United States is filled with copper. Copper responds exceedingly well to being recycled, losing only trace amounts of quality each and every time it’s put through the recycling process. Because of this, the world’s copper fields are only rarely mined. A high-end alloy, brass is used to manufacture a bevy of different products. These products run the gamut from jewelry, to kitchen appliances, to screws, to engines, and much more. Brass is one of the most widely used metals in the world. Fortunately, it is able to be recycled. Though it does lose some of its potency after going through the recycling process, recycled brass is still more than capable of serving a number of different functions. There’s a very good chance that you have some e-scrap laying around your house. E-scrap consists of the metal components that are found inside of electronic products like computers, televisions, and gaming systems. Did you know that the metal components within these items can be recycled? Unfortunately, many of us are not aware of this fact. Instead of recycling the useful metals that are found in our electronic appliances, we tend to throw it in landfills, never to be seen or used again. Now that you are aware, you can earn some money toward your next phone or computer purchase by recycling your e-scrap. Have Metal to Recycle in Oak Brook? Are you hoping to get rid of some metal items? Looking to make some extra cash by recycling metal in Oak Brook? If so, we here at Central Metal Recycling can be of assistance to you. We recycle all of the metals reviewed above….from stainless steel, to copper, to aluminum, to e-scrap, and more. Accepting all sizes of metal loads, we offer payment on the spot.